Drive to Trichy and on arrival, visit Srirangam. 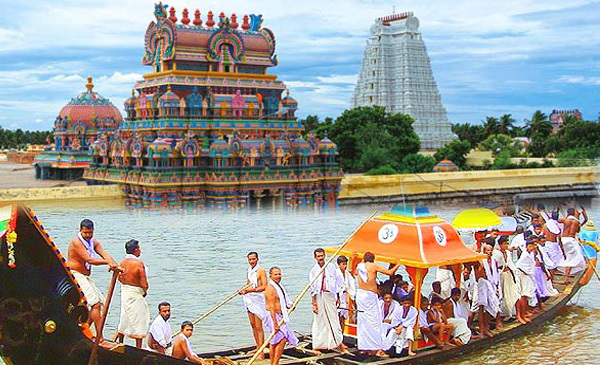 5 kms from Trichy, located in an island is Srirangam. Surrounded by the Kaveri water is a 600 acre island town enclosed within the seven walls on the gigantic Sri Ranganathaswami temple. There are no less than 22 gopurams, one of which is the tallest in India. The 72 m high 13 tiered gopuram dominates the landscape for miles around. The Rock Fort situated on the banks of the Kaveri river, Trichy's most famed land mark is an 84 m high rock, one of the oldest in the world aprox.3,800 million years. The attraction is not for fort itself but the temple at the summit. 344 steps hewn out of rock lead to the top where are the inscriptions dating back to the 3rd century BC Overnight at Hotel.